Turn up the heat & listen to today's hottest musical artists as you style with the ONYX Ceramic Digital 1" Hairstyling Iron with built in MP3 player. Bring Billboard's Hot 100 into your next heat styling experience as you straighten, curl, flip, and wave your hair with the ONYX Ceramic Digital 1" Hairstyling Iron with built in MP3 player by InGlam. Holding up to 500 songs for a customizable playlist, this music centric iron not only brings hairstyling to life but features advanced ONYX Ceramic Technology for superior salon results. Effortlessly smooth strands and create a brilliant shine with the tool's Ceramic Floating and Beveled Plates which produce Negative Ions and Far Infra Red, sealing in vital moisture and repelling humidity for a static and frizz free style. 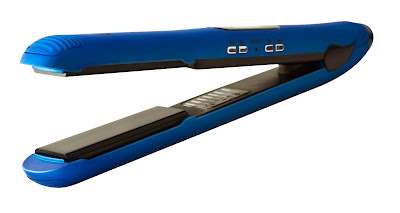 Plus, the ONYX Ceramic Digital 1" Flat Iron reaches up to 420°F due to an advanced MCH Heating System which provides instant heat up with immediate heat recovery for a tool that finally remains at the constant temperature of your choice.